2000 years ago, long before Laguna Beach became one of the most desirable resorts on California?s coast, an Indian tribe named the Ute-Aztecas (later the Shoshones) roamed the land. Lured by the temperate weather and the rich coastal strip, the tribe inhabited the canyon formations directly east of Main Beach. They named the area Lagonas, their word for lakes, after two fresh water lagoons that decorated the canyon. When the Spaniards arrived they applied the name Canada de las Lagunas (Canyon of the Lakes). 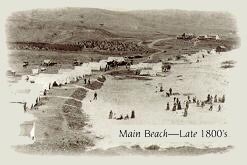 And in 1904, the name of the area was officially changed from Lagonas to Laguna Beach. Laguna has always been a resort area - a place for rest and relaxation. In the early days, people came from miles around to enjoy its beauty and tranquillity, pitching tents on the beach, exploring the intimate coves and the rolling hills. By the late 1800?s, as the word spread, more and more people flocked to the seaside settlement to plant themselves permanently. In 1903 Norman St. Claire (the first important artist) came from San Francisco by train and stage to paint the surf, the hillsides and the lagoons surrounding this seaside village. His artist friends were so impressed with his paintings and reports of a balmy year-round climate that they followed him to Laguna Beach. Many of this seminal group were known as plein-air artists who painted in the style of Monet?s French impressionists and remain at the top of the Who?s Who in California Art list. In early 1918 artist Edgar Payne opened an art gallery and formed the Laguna Beach Art Association (now the Laguna Art Museum). By the late 1920?s approximately 300 people moved to Laguna Beach permanently. Nearly half of those residents were artists. In 1932 the Festival of Arts opened with a stage and booths at a location near the Hotel Laguna. Ten years later the Irvine Bowl was dedicated and the festival grew to become the world-renowned Pageant of the Masters. 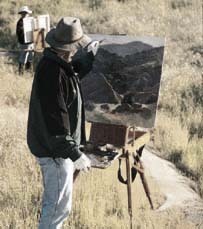 Following the artists came the Hollywood film makers who found Laguna to be every bit as appealing on the silver screen as it was painted on canvas. Many of Hollywood?s famous stars like Bette Davis, Mary Pickford, Mary Miles Minter, Victor Mature, Judy Garland, Rudolph Valentino, Charlie Chaplin and Mickey Rooney maintained homes in Laguna Beach. Over the decades the stars continued to flock to Laguna Beach as did dignitaries like President Franklin D. Roosevelt and writers like John Steinbeck who wrote Tortilla Flats while living at 504 Park Avenue. They traveled to Laguna for inspiration and relaxation, frequenting landmarks like the White House and the Cabrillo Ballroom. Laguna?s universal allure is best expressed on a famous gate built in 1935 (which still stands on the corner of Forest and Park Avenues); it reads ?This gate hangs well and hinders none, refresh and rest, then travel on. ?